LowAndWide.net • View topic - The TurboR gets a new engine. Lots of Potatoes. < Workshop ~ The TurboR gets a new engine. Lots of Potatoes. Stripped the head down removing, all the valves and also the exhaust studs. Strangely I had to tap all the valves out as where the collets go they were tight going through the stems. Never had that problem on other heads Iâ€™ve done, but talking to some others this is quite normal on 531's. All the components out, I will be putting fresh Stem seals in, new valve springs, and exhaust studs. Measured the valves up and they are indeed, 38mm Exhaust and 46mm Inlet in Size, stock sizes are 35mm and 44mm respectively. Stuck them each in the drill and cleaned em up, the intake valves came up pretty well and I think a little bit more polishing should get them really shinee, but the exhaust valves don't seem to be coming up so well. Bit of a delayed start today, woke up around 12ish, I blame my mate foggy as somehow we managed to discuss boost control till around 5am this morning on MSN. Started around 12.30ish by looking under the bonnet of the TurboR, drinking a few cups of tea and smoking a few fags to psych myself up. Couple of hours later, pretty much everything that can be done from up top is disconnected. This cars are so damm simple to strip its actually a pleasure. The last engine pull I did was a FWD volvo and that took nearly a day of stripping to be somewhat near close of pulling the engine. I was quite amazed how damm tough these engines are, I went to drain the coolant and basically there was only perhaps half a radiator's worth, never spilt a drop anywhere there was that little. The worst part of it all has to be the Wiring Loom, thats gonna need some repairs once the engine is out of there. All thats left to do now, is Jack it up, put it on some stands, drain the oil, disconnect the powah Steering pump. Undo the Oil Cooler lines, and remove the clutch slave cylinder, then the whole shooting match can be pulled out. Will be so nice not to have all the oil leaks like the ones below, the old T3 was certainly chucking its oil out under boost! and now that my valve grinding stick has arrived, I'm going to spend the evening lapping in the valves and reasembling the 531. Pics to follow later. So at around 2am last night I finished lapping all the valves in, strangely when I went to install my new valve springs, I discovered that this head has had some uprated springs fitted, so I decided to keep them. So if anyone wants some brand new 531 valves springs, I have em for sale. DAY 3 comes about, another parts run for the last bits I needed, my wallet takes another hit, but surely its worth it. the head about to go on, the exhaust valves didnt clean up any better, so there going back in as they ended up. I then set about finishing the sump gasket, which I tore off so that I could install a Auxilery shaft that will run a block mounted dizzy in preparation for MS&S. As to the specs of the block, welll its old school baby, its basically 13mm rods, with B230ET pistons, new bearings, shells, oil pump, slightly bored out, but nothing wrighting home about, no oil squirters, or any of that clever crap. I then bolted the head down onto the block, as to where the pic of that is I don't know!!! AND WHO SAYS I NEVER USE AXLE STANDS EH!!!!!! bit of jiggery pokey and the whole lot came out gearbox as well. I then spent some time, splitting the gearbox of the back of it, now I'm sure when I installed the m90 gearbox 6months ago it had a full complement of engine to gearbox bolts, I only recovered 3 bolts holding the lot together!!!! I think I'll use some locking compound this time!!!! I then stripped the old engine off all the ancilleries I would need, like the motronic flywheel sensors, Head Mount dizzy etc etc. I then removed the old 531 to put into storage seeing as its quite a valuable piece of kit. And Day 4 begins with one mighty hangover from drinking way too many pints in the pub last night. So I roll the car into the street and get the gunk out and brush it into the engine bay, bit of pressure washing later and voila its not come up to bad. I let it drip dry for a while then pushed it back on the drive and wirebrushed up any rust and then repainted, also I installed 2 new engine mounts. I then seem to spend quite a good part of the day cleaning bits that have 20 years worth of oil grime on them. I give the M90 a good degresasing as it seems a shame to bolt it up to a nice new clean engine. I discover an inheriant weakness with the m90, which I'll have to address tommorrow. I then spend some time going through my large box of volvo gaskets, digging out the parts required for the turbo. hour or so later, I have a brand new Spankers T3 bolted onto my ported out early style manifold. New Water Coolant pipes, and drain pipes are also installed. I do a few last minute changes to some water pipes on the turbo side of the engine and its time to slip the manifold on. Just needs bolting down then I'll install the oil feed pipe. so thats where we are at the moment, tommorrow should see the camshaft installed, the last few ancilliers installed and then its new engine up on the engine crane for flywheel and clutch install and then marrying up to the repaired m90 and the lot dropping back in. Maybe tommorrow night it'll be running or poor foggy will be made to earn his board when he stops over saturday night from devon and help me put the last of it back together on the sunday. MY neighbours love me, here is my degreasing bay. What ever I used has started to destroy the tarmac!!!! Day 5 begins with it raining on and off. So with a fishing umbrella in hand, I step into the engine bay and repair the wiring harness. There were broken sensor wires shorting each other out everywhere, but after a couple of hours I had everything sorted and I rewrapped the loom so it looks pretty presentable. Then I went back to cleaning up some more bloody parts before installing them on the engine. I didnt take any pictures because I didnt feel like I've made much progress. So tommorrow, the engines going up on the crane and the flywheel and clutch and m90 will be hung off the back and it'll be dropped in and then everything hooked up, so we should have a running car tomorrow. Oh as for the broken M90, well I had a few goes at repairing it, and well this time it seems to be holding quite nicely. I used a mouldable putty that sets like steel in 10mins. Starts a little late after the accident from last night. Foggy and me decided to go into town and get a takeaway, we pulled off a set of traffic lights and a Drunk Polish guy ran straight cross in front of us, Foggy slammed on the brakes and tried to steer round him, but bang we hit him around 20mph. I thought he was dead, especially as I'd seen just one leg flaying over the bonnet. But he was pretty much ok, complaining of a pain in his leg. The ambulance took him to hospital, allthough he wanted to get up and carrying on drinking. The police cleared Foggy of responisbilty due to the numerous witness statements they had recieved. The damage the guy did to Foggys 360. Final wiring repair in the engine bay is compled and I installed a new Downpipe Heat shield. Some last minute gratusious shots of the engine on the stand. Then it came of the stand after being on there for the last 3 years and the Flywheel and clutch were installed and the m90 Bolted on. Then a quick bit of jiggery pokey and the engine and gearbox were installed in the car. Below foggy is fiddling with something just moments after its dropped in. Then it was the lovely task of just hooking everything back up. 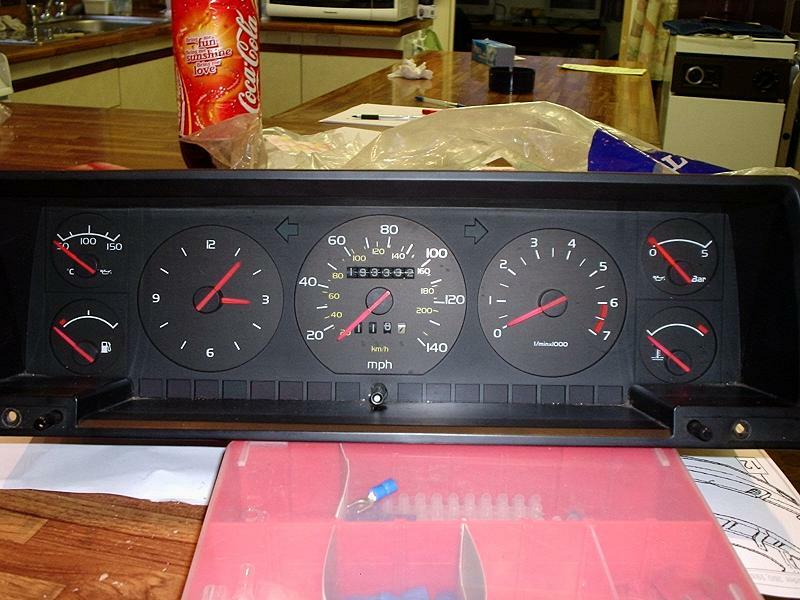 Foggy went off and found his own version of heaven (he loves gauges, he has every type of gauge possible in his 360) by installing some new gauges in the cluster so that a close eye can be kept on the new engine. And so the process off reinstalling bits carried on. We had some fun and games after reinstalling the front bodywork and the left hand side bonnet release mechanism. The bonnet wouldnt bloody open, but after a good 15mins faffing about it was all good and we could carry on with the final hook up. Then finally everything was hooked up, fluids were added, and there were no leaks without the car running. Then it was time to fire the car up. Check its in Neutral, Turn key to stage 2, then stage 3. So out came the multimeters, then the battery came out of the estate as we suspected with the engine being so tight the starter was struggling. still Nowt, then a quick check off the starter on the estate revealed we'd put the signal wire on the wrong connector. Swapped over and fired first time. Ran it up for 15mins to get up to temp, rechecked all fluid levels, not a single leak anywhere. Then we took it out to get a chinese in it, No not run a oriental person over, but some food. The car drove fine and stock boost level is around 6psi climbing to 7ish under load. I think the only thing that needs some work is I need to realign the downpipe as its a bit close to the chassis. Next step is to Fit an Electric Fan on the front and loose the Viscous Fan, I've got a Uprated Camshaft coming from sweden as we speak, then after I've got a couple thousand miles on the engine is to turn the boost back up to 17psi and see what its kicking out on the Dyno. The old engine with 195,000miles managed 146 @ the wheels, and I had one hell of a boost leak. So hopefully I'll be somewhere round the 200 mark now, allthough the T3 will be pretty much at its maximum effieceny then. So I've got my Megasuirt ECU system to install along with bigger injectors and then its a case of working out what trim sizes my hybrid turbo will need to be to give me the boost to run somewhere near 300 at the wheels. Great for two reasons, 1 it's a return of an old-school step by step post with pics, god I have missed these! And 2 it's a Volvo woooo! I miss my Volvo so much, such a great car to work on, mind you I did get tired of having to lean so far into the bay sometimes. Great reading through this, will be interesting to see how it performs at 17psi. The Volvo stuff isn't too far from the Vauxhall stuff in a lot of respects. You have the B200ET, B200FT, B230ET & B230FT engines, basically 2.0l and 2.3l turbo lumps of American and European spec. They use either Mitsibushi or Garret turbos and usually Bosch Motronic injection. All the basic stuff is the same, nothing too different really. Some neat features like an external oil cooler and oil drain on the intercooler. spanking build matey I hope it continues to go aswell! nice ot see something different! Love the potatoes - there's something so satisfying about an engine sitting there on a stand gleaming. I wish I had painted my block red now, looks the shnizzell! Didnt take too many pics as swapped the cam over in my mates street in North Wales, whilst I was up visiting him. The only thing of note was that the smegging Genuine Volvo Front Cam Seal I paid Â£8 for was utter shite(the Spring inside the seal kept popping out when trying to install it), the pattern Elring seal I bought for Â£2 was much better. Anyway the cam was installed, checked the clearances, out came the cam again, reshimmed it up with the use of my mates shim kit (the main reason I drove 400miles roundtrip to wales) and took the thing out for a settling in drive. The Cam really does make a diffence, before the old A cam would fall off over 5,000rpm but the V16 Cam really pulls hard to the limiter at 6200rpm allthough the cam is rated to 6500rpm. Cruised back down from wales at a leisurely pace still breaking the engine in, when as I got near Birmingham I noticed I was about 5 miles off having done 1000miles on the engine, so a quick detour onto birminghams latest pay to use runway and I just planted my foot to the floor in 5th gear and passed the 1000mile mark at this speed and it was still pulling. Popped into some services to refuel and check things out. Slapped half a tank of 97 octane in and turned the boost upto 14psi, still could hear some ping, so back to 12psi it went. But filmed this anyway, wanted to compare it to some older vids of mine, Comparing it to my old vids I would say that my 50-120 time has dropped by 2seconds. So the cars now quicker at just 12psi than it used to be at 17psi, but I'm running out of fuel to turn the boost up, so I've been cracking on and now have MS all built up and its working well. I've been playing with the Stimulator and Software on my PC. Just need to make a harness now and get it connected it up to the car, and finish of my new Inlet manifold with Larger Injectors and Modified TPS. Don't know why I managed to post as a guest?? ?